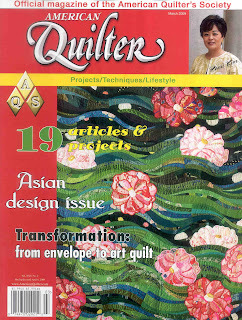 The March 2009 issue of AQS American Quilter is now out, and what a beautiful magazine it is. This is a special Asian design issue, so if you've been building a stash of Oriental prints and looking for ideas, this one certainly has lots. My Oriental Beauty is featured on page 62 of the issue. 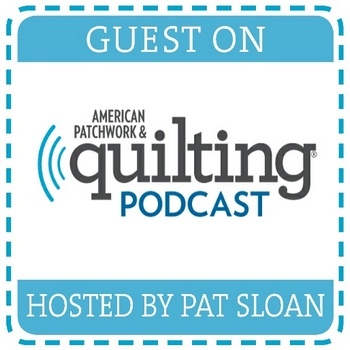 If you've attended a Maritime Beauty workshop and have been enjoying sewing New York Beauty blocks this will take you to the next level of achievement. 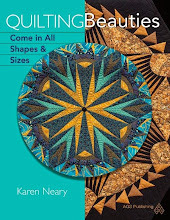 The fabrics for the 2009 Trend Tex Challenge through The Canadian Quilter's Association (CQA) arrived some time back. As the deadline is too quickly approaching, it's time to give some thought as to how to puzzle these pieces together. The theme this year is "Roots" and that has been ricocheting around my brain; lots of possibilities have been visited, but nothing settled on as yet. 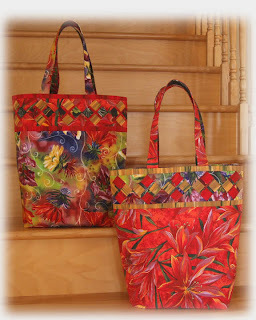 The fabrics are a varied assortment of floral print, stripe and tone-on-tones. Three are from Michael Miller, one is a Jinny Beyer and the dreamy blue is "Gypsy Princess" by Hoffman. 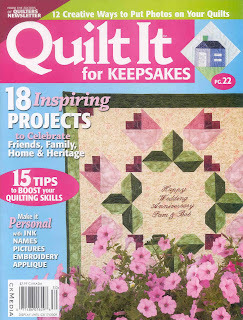 The deadline for the quilts to arrive in Alberta is mid-March, so hopefully inspiration will hit soon. 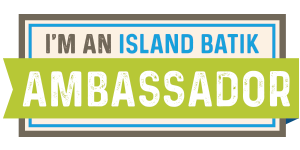 This is my 8th or 9th year participating in this challenge, and it's always lots of fun to see the entries. If you are interested in seeing the construction of my piece last year ("From The Edge") just scroll back through Older Posts at the bottom of this screen. A quick snap of the finished New York Beauty which has now been signed, sealed and delivered to its new owner. Later I will photograph it properly in an appropriate setting, but for now this will do as I am anxious to begin another project. 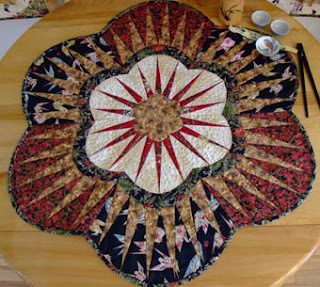 The only thing better than finishing a quilt is starting a new one. 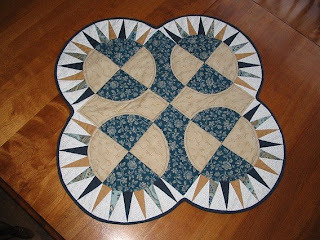 I worked away at the quilting over the weekend. It's fun to use a variety of threads in the work. This is holographic thread, which picks up the light nicely. 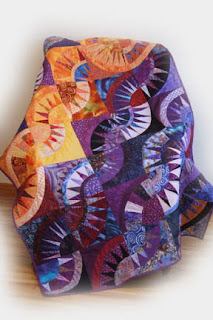 The end of the points have corkscrew motifs quilted, to make it look like sparks are flying. Another day should bring this project pretty much to a close. This gorgeous red print and coordinates are from the Hollyhock collection from Camelot Cottons. Doreen from Dayle's had mentioned to me that she had it on order and called yesterday when it arrived; I rushed right down. My sons think it is funny that a store would call me when they have new fabric in stock, but I think it's wonderful - truly one of the perks of living in a small town. Here's another Maritime Beauty, sent in by Sharon from Oxford, N.S. 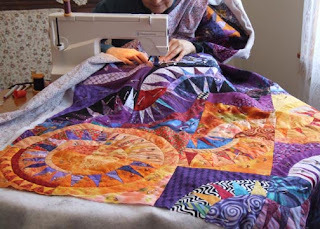 This was made for a Christmas gift, and she has chosen colours to match the recipient's home. 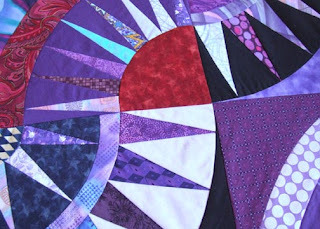 Done with only two colours in the centre, this version has a very classy, uncluttered look. 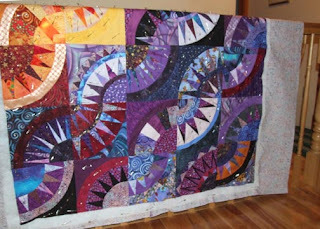 My own latest NYB still needs about a dozen blocks, and then I'll start to piece the borders. Naturally, I have left the most detailed blocks to the last, but it is coming nicely and has been a pleasure to stitch. In the lyrics to one of their songs, Newfoundland band Great Big Sea sings: "this is my one small step, this is my walk on the moon..." That pretty much sums up 2008 for me, a year which saw so many dreams come true. How fitting that the year ended in a very dramatic blizzard here in Nova Scotia. 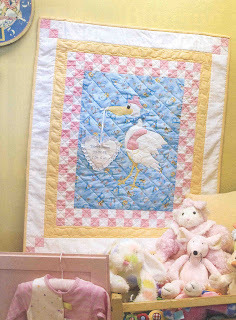 "The Day The Stork Arrived" shows an easy way to make a quilt ahead of time to have ready to personalize with the baby's name, weight, date and time of birth. Printing on treated photo sheets is a terrific way to have the quilt ready for the big moment. 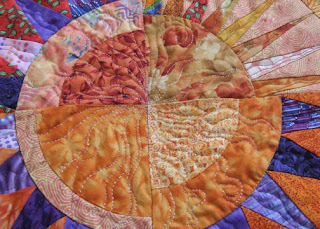 I wish you all a wonderful and prosperous 2009, with many days set aside for the pleasures of quilting.